SAP needs to address big data, streaming and IoT apps. Altiscale would accelerate efforts to deliver high-scale and high-performance cloud data services. SAP is acquiring Altiscale, VentureBeat reported on August 25. SAP neither confirmed nor denied the report, offering a statement that it “does not comment on market rumors or speculation.” If the acquisition is real, it would, in my view, make sense. Altiscale is a four-year-old startup that specializes in cloud-based Hadoop and Spark services. As such it technically competes against mainstream Hadoop services, such as Amazon Elastic MapReduce, Microsoft HDInight and Google Cloud Dataproc. 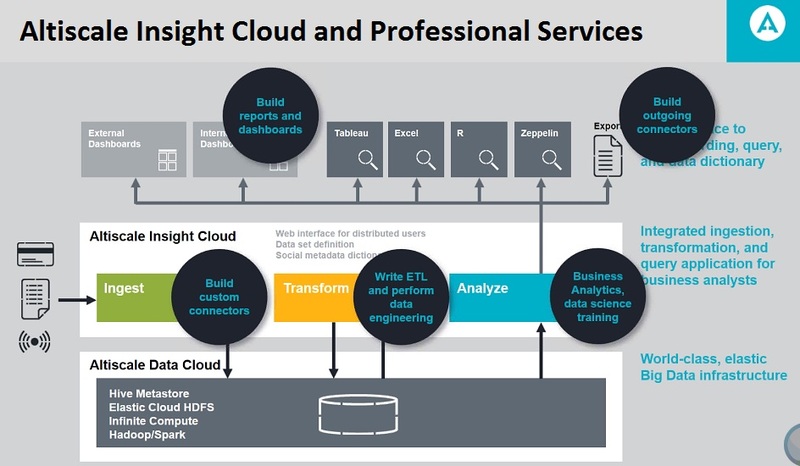 But Altiscale differentiates itself from these low-cost providers by combining high-performance Hadoop and Spark services with integrated ingestion, transformation, and analytical capabilities via its Altiscale Insight Cloud offering. A small niche player, the company also stresses high-touch support and professional services, which puts it in more direct competition with Qubole. Altiscale combines Hadoop and Spark cloud services with integrated data ingest, prep and analytics as well as supporting professional services. By acquiring Altiscale, SAP would quickly gain capacity and deep expertise for delivering Hadoop, Spark and high-scale data services. All of the above would complement SAP’s cloud and IoT strategies while reducing the need for customers to work with third-party vendors. SAP HANA continues to be the cornerstone of the company’s data-management strategy, but at SAPPHIRE 2015 the company announced that it will also rely on Hadoop and Spark to support its big data and IoT strategies. SAP subsequently announced, and in March made generally available, Hana Vora, which uses Spark to provide interactive analytics on high-scale data in Hadoop. MyPOV: If this deal is real, I think it will be a boon to SAP. The company is, of course, partnered with all of the leading Hadoop software distributors and with Spark overseer Databricks, but to date the company has lacked its own Hadoop and Spark services. Altiscale would enable SAP to help customers with high-scale data capacity and data pipelines without relying on third-party vendors. What remains to be seen – again, if the deal is real – is how and whether Altiscale’s existing services would change in the wake of an acquisition. Altiscale could not be reached in time for comment. Earlier this year I interviewed executives at Altiscale customer MarketShare for an in-depth case study, and they were quite happy with the company’s services. Although costs were higher for Altiscale than for Amazon EMR, the Hadoop service it previously used, MarketShare reported that its Hadoop jobs were completed in one-quarter to one-fifth the time and at 65 percent to 70 percent of the cost on Altiscale. It’s a compelling story, but one that’s hard for a small vendor to get out there when up against the biggest public cloud service providers in the industry.